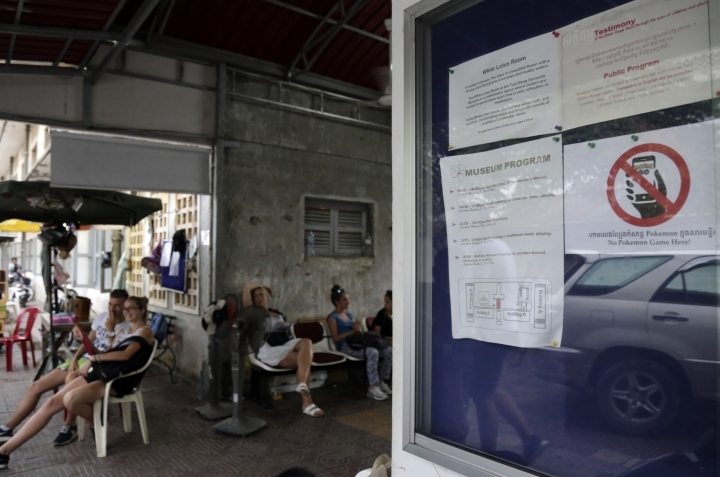 PHNOM PENH, Cambodia — The game "Pokemon Go" has caused distress in Cambodia, where some smartphone-wielding players have been chasing its virtual characters at a genocide museum that was a torture center in the 1970s. Tuol Sleng Genocide Museum director Chhay Visoth said Wednesday that he has posted signs at the site's entrance and inside banning the popular game, which made its Cambodian debut last weekend, and told his staff to watch out for anyone playing it. He described the museum as a memorial to Cambodia's suffering. Since the warnings were put up, there have been no reports of tourists playing the game there, he said. During the 1975-79 Khmer Rouge regime an estimated 17,000 Cambodians were tortured at the center, known as S-21 prison, and then killed. An estimated 1.7 million Cambodians died from execution, starvation and inadequate medical care under the rule of the ultra-communist group. "Tuol Sleng Genocide Museum is not a shopping mall or a playground to catch Pokemon," said Youk Chhang, head of the Documentation Center of Cambodia, which has collected more than a million documents related to the Khmer Rouge terror. "Pokemon is a game. It must be banned and deleted immediately." Chum Mey, one of a handful of survivors from the prison, said he was unaware of visitors playing the game, even though he has a stand there where he sells copies of his story of survival to support himself. But he said he opposed having the site of such suffering host the game. "I do not support having Pokemon Go be allowed to exist here because this genocide museum is the place for Cambodian people to remember the suffering and harm experienced under the Khmer Rouge regime," the octogenarian said by phone. Pokemon Go overlays cartoon characters on a smartphone map of the actual physical landscape. Since the point of the game is to capture the creatures in their real-life surroundings, hordes of people converge on the landmarks where they are found to advance their scores. The situation has ruffled feathers all over the world, in addition to disrupting activities at places such as hospitals and military bases. Sensitivities have been offended by the reported appearance of enthusiasts at sites such as the former concentration camp at Auschwitz in Poland, Arlington National Cemetery and the Holocaust Memorial Museum in the United States, and Japan's Hiroshima Peace Memorial Park.